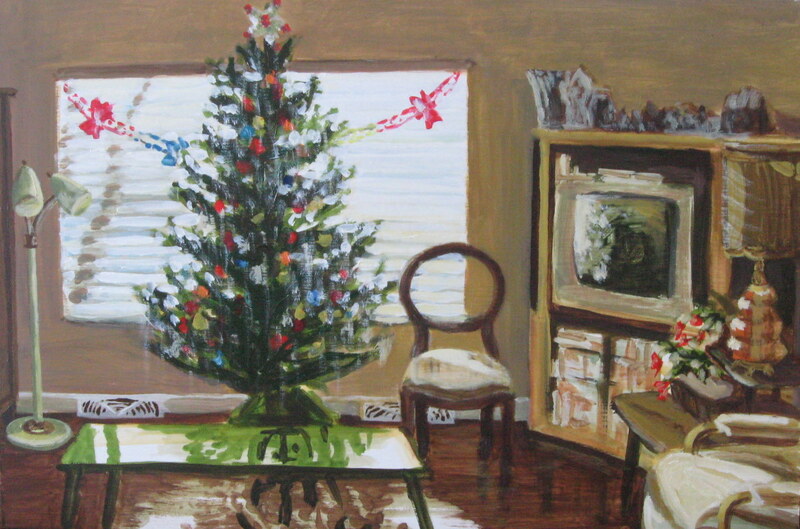 Living room with Tree, 3pm. I had an incredibly productive day on Tuesday and decided to start my painting for this week’s post. I worked on it during my daughter’s hour of “quiet-time” (formerly known as nap-time) over 3 days. And for once it was actually sunny 3 days in a row! My daughter was very excited when she came out from her quiet-time and saw it. She started listing off everything I had painted in third person: “Mommy paint the bushy tree, mommy paint the T.V., mommy paint the rocking chair.” Then she went to look at the living room and came back quite perturbed, demanding, “Mommy paint the couch.” It’s true, the couch should be in the very front, but there just wasn’t room. You would only see the top of it as a long brown stripe at the bottom of the painting. The composition is pretty tight and not as in “excellent.” My daughter is becoming quite the art critic. Very nice, Dayna. I like the TV and the tree especially. I like this painting. Tree looks nice and the livingroom is cozy.